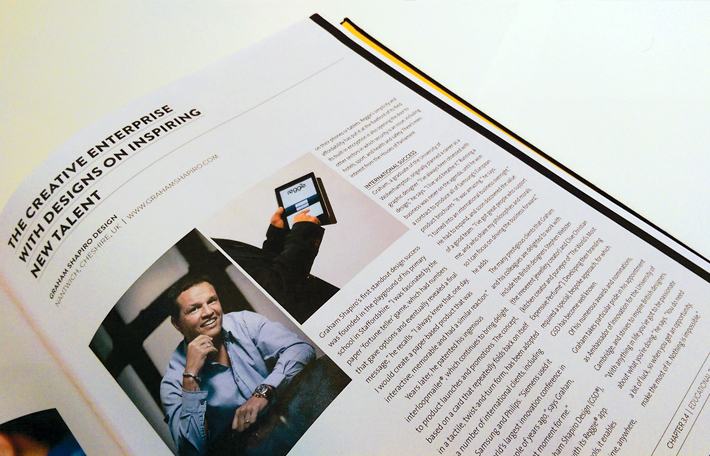 GSD® CEO & Founder Graham Shapiro was honoured to feature in The Inspiring Leadership and Innovation, an official Cambridge University Students’ Union (CUSU) publication. CEO Graham Shapiro is an Ambassador of Innovation for The University of Cambridge. The University of Cambridge is one of the world’s most recognisable and respected names in education and research, and has been leading its field for over 800 years. Behind its magnificent buildings and architecture lies one of the world’s richest sources of intellectual talent. It is the exemplary education on offer from Cambridge that makes its global reputation so remarkable. Countries throughout the world have benefited from prime ministers, scientists, scholars, professors, medics, business leaders, industrialists and entrepreneurs who share this common denominator of excellence. The University of Cambridge is a world-leading model of educational excellence with a reputation that spans the centuries. This long-standing status does not mean, however, that it’s an institution content to rest on its laurels. On the contrary, the university and its colleges continue to invest in the future to deliver an exceptional education to the students of today and tomorrow. Produced by Cambridge University Students’ Union (CUSU) and St James’s House publishers Cambridge: Inspiring Leadership & Innovation is a lively and informative mix of news, practical information and in-depth articles. Charting the university’s success stories from past and present, and providing current students with the tools and inspiration to follow suit, the book also highlights how selected people and organisations from around the world are promoting best practice and nurturing new innovations.